With a market that continues to grow and show strength, it’s easy to rest and not concern ourselves with the stress an anxiety that affected us when the bear market was in full swing. I think it’s important to continue education while at the same time utilizing the new studies as just another way to analyze the market and the positions we may enter or leave. If you are new to Renko charts, that is fine. They are much easier to understand when compared to Japanese Candlesticks. 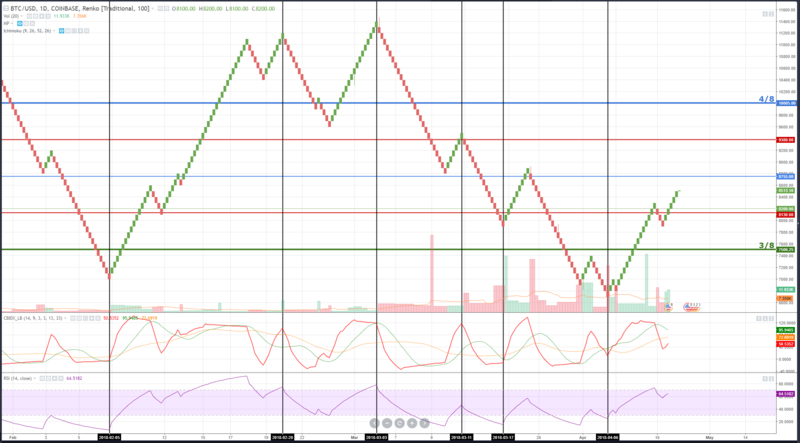 Renko charts form bricks. Each brick is formed only after a certain amount of price action has completed. On this chart, the amount is 100, or $100. So if a brick forms/closes at the price level of 7500, then the next brick will generate at either 7600 (green brick) or at 7400 (red brick). This makes the charts look significantly less ‘noisy’ because there is no time factor, just price. One of the greatest methods to trading Renko effectively is utilizing an oscillator with your trading. I use two, the Composite Index and the RSI. 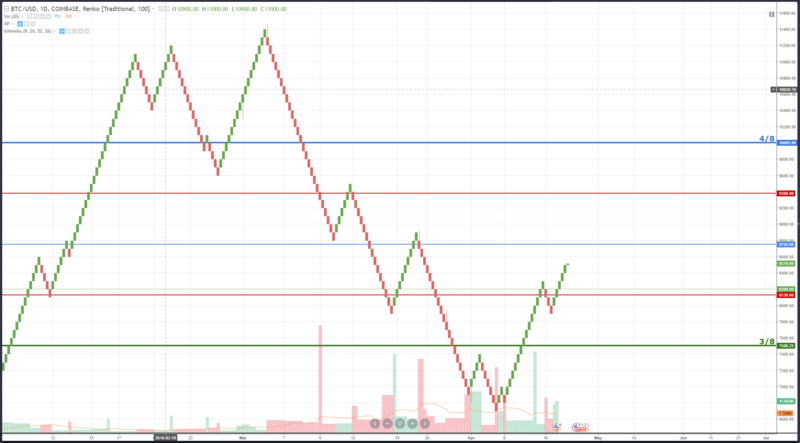 Observe how easy it is to identify new swings when the RSI and the CI are both displaying similar structure and a change in a Renko brick has happened. The vertical lines show periods when a high in price (Renko) also happens when there is a similar structure (high and low) in the both RSI and the CI. This kind of analysis can help traders very clearly, cleanly and easily find entries and exits without having do a considerable amount of analysis.